There comes a time in most people’s lives when, like a hermit crab, you’ve outgrown your old home. Maybe it’s not comfortable anymore, maybe you need more room or less, or maybe it’s not in the ideal location. But when that happens, do you move onto bigger and better things, or knock down a few walls and make what you have work for you? It’s not an easy question to answer, and in the end it will come down to your own personal wants, needs and situation. But to help you decide, we’ve collected all the pros and cons of each option to help you work out what’s better for you. You like your current area and community. Your home is in a good location for your lifestyle. Maybe it’s close to family and friends, or your kid’s school, or public transport. In real estate, the mantra really is ‘location, location, location’, so if you’re in a good place, you might not want to let it go. You have specific needs or wants for your home. Renovations are customisable, whereas there’s no guarantee of finding everything you want in a new home. So if you’ve got your heart set on a fireplace in your bathroom, renovating might get you there quicker than real estate shopping. You only want to or can only afford to make small changes gradually. Renovations can be done at your own pace, so you can spend the next five years slowly upgrading different areas of your home if you want. Your current home loan is a cracking deal. Consider what you’re paying now, vs what you’d wind up paying if you had to refinance. Take a look at the best home loan offers on the market today, and if your current home loan has lower interest rates and repayments, it might be worth sticking with your current place. You have the skills and know-how to do the renovations yourself. If you can go D.I.Y, you stand to save a bundle. Say you decide to renovate - tear out the 50’s bathroom and replace it with a sleek modern number, gut the cramped, dark kitchen and turn it into an open, airy space worthy of a five-star chef, put in new flooring throughout and a swanky back deck to top it off. $100,000 later, you’ve got your place looking spick and span. And then five years down the track, you decide to sell it, but here’s the problem - all the offers coming in are way below what it’s worth. What’s going on? This is called over-capitalisation - when you’ve improved your home so much that you won’t get your money back when you sell it. Buyers look in certain suburbs expecting house prices to be around a similar level - if your house is worth much more than all the neighbouring ones, chances are you won’t get house hunters who are interested in spending that much. To avoid over-capitalising when you renovate, look at your suburb's median house price and aim to make your home worth that much or a little more - but don’t go over the top or your house could wallow on the market for a long time. You need more space than is physically available - you can add extensions to your house if you have the room, but if you’re looking for more yard space or more room all around, moving will be the best option. You’re downsizing. On the other hand, if your kids have moved out and you find yourself with too much space, renovations won’t help, and you might have to sell up. Renovations aren’t possible. This may be because of time or physical constraints. The basic structure of your house isn’t what you want. If you love modern architecture, but your current home is an old colonial, moving may be the only way to get a house you really love. The market is great for selling. In this case, you may save a bundle by selling up, rather than going in for expensive renovations. What will cost me less? It’s hard to say what’s going to be more cost effective, mainly because the property market is always changing. The best thing to do is buckle down and crunch some numbers to work out what’s best for you. The key to moving is doing it at a time when you can sell your house, buy another one and break even or - if you’re lucky (and property savvy) - make a profit. Head over to our home loan hub for some valuable insights into the property market, then run the numbers with our stamp duty calculator to see what you’ll be up for in government fees. Finally, find yourself a great refinancing home loan in our comparison tables. The cost of renovations will depend on what you plan to do - small repairs might only cost a couple of hundred dollars, but if you need to overhaul your entire house, that could rack up a bill of hundreds of thousands of dollars. 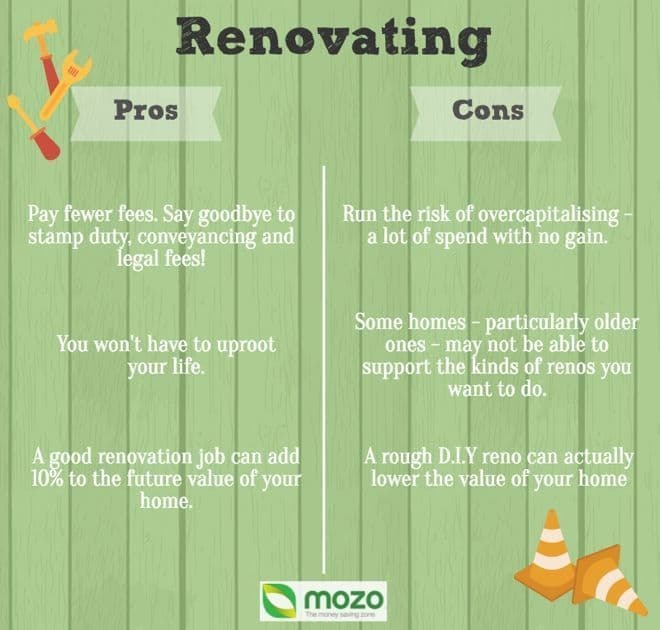 Check out our guide on how to improve the value of your home for some good ideas on which renos to go for, and then head over to our comparison page and find a killer personal loan to make it happen.